The sequel to the original Suikoden improves on its predecessor in a countless number of ways. It explores the concepts of love, betrayal, loyalty, and loss in what are considered by many to be the most beautiful 2D graphics on the Playstation. Play as Riou, who slowly becomes a leader, but at what cost? Riou is the first name of the main character in novels released only in Japan. He is not given a first name in the game. This is a complete list of all of the Stars of Destiny (recruitable characters) in Suikoden II. It details where they're found and how to get them. A complete walkthrough of the game. Special thanks go to JohnathanLSawyer for allowing us to use his walkthrough. 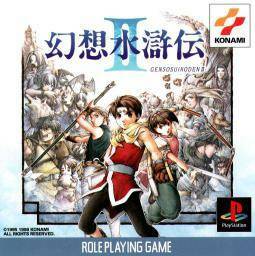 The staff at Suikosource have created many guides to help you through Suikoden II. Almost any information you might want to know about the game is listed here. Tips, tricks, and hidden items abound in Suikoden II. This is a list of the ones of which we are aware. Suikoden II is filled with scenes that are memorable for their overall emotional impact. We've transcribed a few of the scenes we think are the most poignant. Here is game saves taken using the InterAct DexDrive(no longer sold) of throughout the game of Suikoden II, to put you to anywhere you want to be in the game, immediately. There are many things in Suikoden II that are of a controversial nature. Here are some in depth looks at them. This lists all available releases of Suikoden II across all platforms and various re-releases over the years.